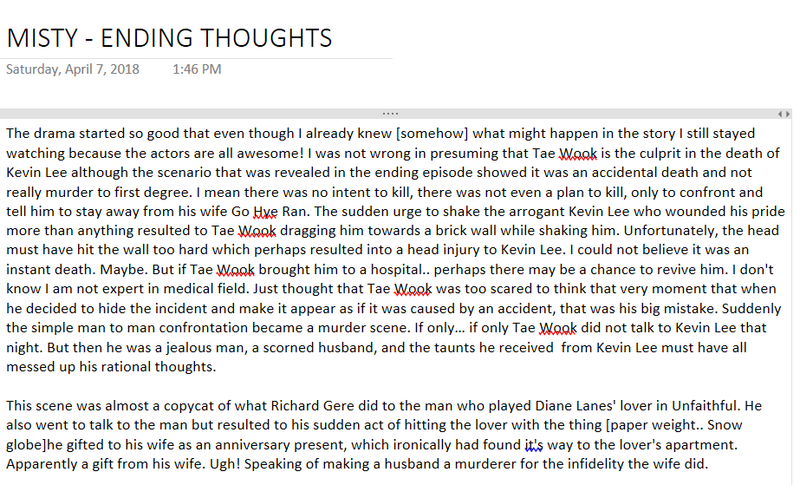 Finally I was able to write something about the ending of the drama. Still waiting for my favorite song Hallucination to be shared. Thanks to the uploader for sharing these precious moments of my bias group as they sing their classics and new songs from Gentlemen’s Game album, their last before TaecYeon enlisted to the military. Since I love 2PM and all their songs I want to share this compiled songs from their concert. In the meantime this is on my repeat watch while waiting for my weekend drama MISTY. the drama is still keeping secret who is the true culprit . MISTY - A Cheater or a Murderer? Short thoughts on MISTY ep 8..
Never thought a "guess" 👉 like a call from GHR to Kevin Lee the night he died was enough to get a warrant of arrest. The wife was not sure it was GHR he was talking to. Even the scene was vague whom he got that call. Maybe it was GHR because they did met that night but it was not as clear as crystal though. Everyone seems out to get her. Even with circumstancial evidence only (the brooch) GHR is being made to be the "only" suspect in the murder of KL. As for the wife..she knew GHR was not the killer. She said so. If she hides the video chip GHR will end up as the suspect. It means GHR is not the one who killed her husband. She is being vindictive. Well she can because she is a woman scorned. She has a right to make GHR feel the pain. But to make GHR the murderer when she knew it was not true seems stretching her revenge too far. She needs to go after the one who killed her husband. I love how gutsy GHR is. She was asked for a choice. 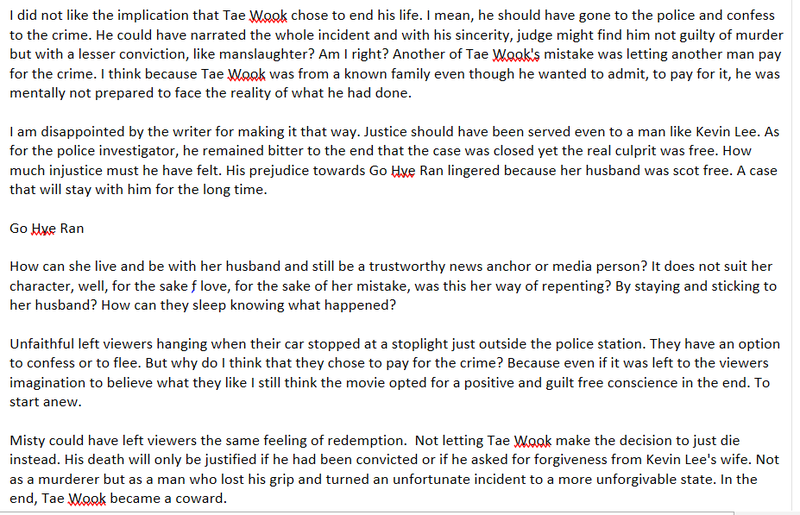 To be a cheater in front of her husband Tae Wook or to be a suspect as the killer. She chose none. She is too smart to know the wife will do anything she pleases. GHR is strong to face whatever comes her way. The fact that she did not kill KL makes her even more want to achieve her dreams. I am really doubting his innocence here. His love towards his wife is so huge he will do anything for her. Is it blind love? I don't know. But I am looking forward to how far he will protect GHR in this fight against prosecutors and public's opinion. I like how in the end he chose to support GHR. I love their relationship as hoobae/sunbae. I think she killed the man from her past. She was lucky to have escaped punishment because someone admitted to the killing 👉 the man who just got out of prison. As for my question if GHR is a cheater or a murderer? I think she was none of those two things. Circumstances placed her in a position where she was cornered by Kevin Lee and she met him to make her revenge perhaps? The scene in the car left a lot to understand. There is more that has not been revealed. And definitely she is not a murderer. So far the drama is still intriguing. Almost every scene in the drama are worth watching. Final episode brought so much tears and heartwrenching moments that depict real life’s scenarios when one is facing death and of someone coming to terms of possibly being left behind. Separation is always painful. Being sick is worrisome and the thought of dying really frightens and weakens even the most strong person. It is the reality that no one wants to face..ever. One scene that really stood out showing our otp moment was this scene from the hospital with Moon Soo finally breaking down in front of Gang Doo. She had finally faced that scary reality that she told him not to die. She cried while telling him. I teared up seeing Gang Doo hugged her tight as he also cried silently for this woman he loves. Who wants to leave a loved one permanently anyway? The thought of leaving also scares him and hurts him. Yes they did! They made us anxious on our seats for almost the entire episode with our hearts dropping every minute. There were sweet moments to remember, but even those moments would not ease our worries. It only made us think that these sweet moments were going to be memories left for Moon Soo to keep forever. But thankfully, the story gave us hope in the end. Miracles do happen. And it happened to Gang Doo. He lived. He was given another chance to live and be happy this time around. I think the story has come full circle. Moon Soo and Gang Doo both suffered and now both recovering together. They are healing together from past trauma. I like Gang Doo’s narrative said how he has to take care of himself. He cannot be harmed because someone will cry. For a melodrama this one made it to my top list. Gang Doo and Moon Soo are characters that will be remembered for a long time. A classic example of love that gives hope, heals and won against the odds. Something that reminds me of Nicholas Sparks’ novels like A Walk to Remember and The Last Song. Both novels are about hope, miracles and healing. I think some scenes were inspired by these novels. The narration towards the end was reminiscent of Landon standing at the bridge thinking how Jamie changed him to be a better man. Although with a different ending I think the atmosphere are kind of the same. With The Last Song… the memorial was like the window pane (? not sure if it was called that..). Anyway, it was a rollercoaster ride watching Just Between Lovers but worth it. I fell in love when Moon Soo and Gang Doo fell in love and hurt when they suffered. Talk about being one with the characters. This is how deeply I was moved by the simplicity of this drama, but powerful enough to make a lasting impression. Welcome to Waikiki – a kdrama /sitcom that is enough to make stress go away. I know the drama is silly and full of slapsticks as if some scenes were taken from Mr. Bean and The 3 Stooges. The foolishness of the characters are pretty much absurd but still it causes me to grin and laugh. Well, a good laugh is always good for our health. The toddler is an added nice touch for the sitcom. The cute smiles of the kid is always a welcome scene in each frame. While adults are bickering or doing crazy antics the camera zooming in onto the child’s face which has awesome expressions is good. She melts the viewers’ hearts. I am rooting for the otp Dong Gu Yoon A. And of course Lee Jun Ki (one of the character) played by Lee Yi Kyung is enough to make me go crazy with his endless misfortunes and antics. He and comedic scenes are like soulmates. He is just fun to watch. This is one show one should not really critic for storyline. This is made to make people relax and watch while having fun. Stupidity is the theme of the sitcom. JTBC is on a roll. Lovin the recent dramas. Like Misty which is also currently showing full of intrigues. Want a breather from some kdramas that have same plots but different actors only? This is entertaining enough. Let silliness dispel our daily worries and stress even for 2 hours a week. You might actually find yourself laughing in surprise.